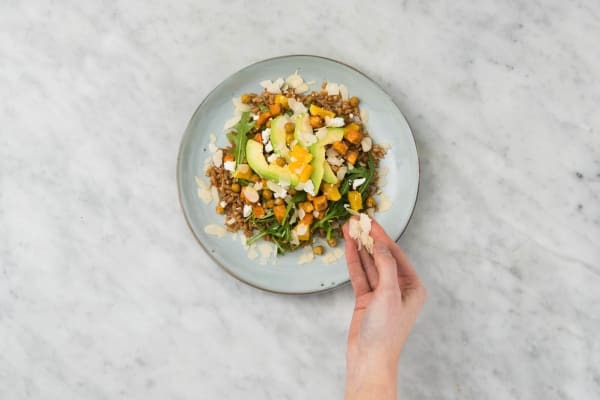 With so many nutritious and delicious ingredients in this citrusy dish, you’ll be asking, “Orange you glad I made dinner?” We kid, but this recipe really does feature an outstanding array of vibrant foods. There are cubes of vitamin-A-rich sweet potatoes, slices of creamy avocado, protein-packing chickpeas, and a bright citrus dressing that ties it all together. Oh, and a bed of tender, fiber-rich farro to add some ancient-grain oomph. Wash and dry all produce. Adjust rack to middle position and preheat oven to 400 degrees. 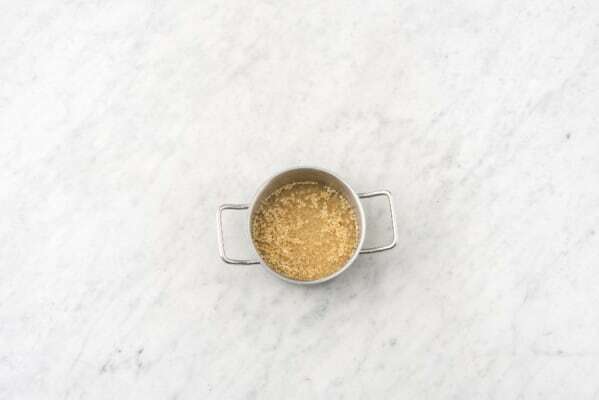 In a medium pot, bring 3½ cups water and stock concentrate to a boil. Halve orange and lemon crosswise. 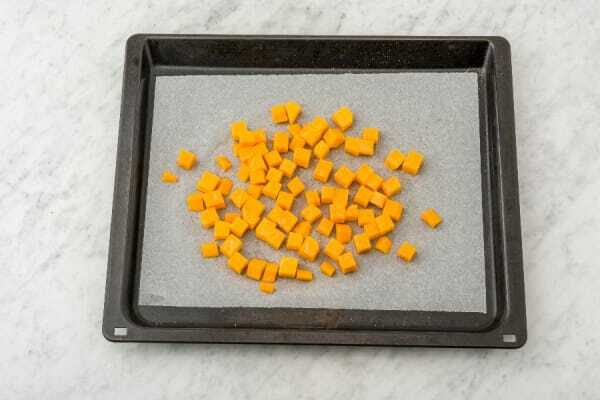 Peel sweet potatoes, then cut into ½-inch cubes. Drain and rinse chickpeas. Toss sweet potatoes on one side of a baking sheet with a drizzle of olive oil and a pinch of salt and pepper. Toss chickpeas on other side of sheet with another drizzle of olive oil and a pinch of salt and pepper. Roast in oven until sweet potatoes are tender and chickpeas are crisp, 20-25 minutes. Once stock is boiling, add farro to pot. Cover, lower heat, and simmer until tender, 25-30 minutes. TIP: If there is still water in pot after cooking, drain farro, then return to pot. 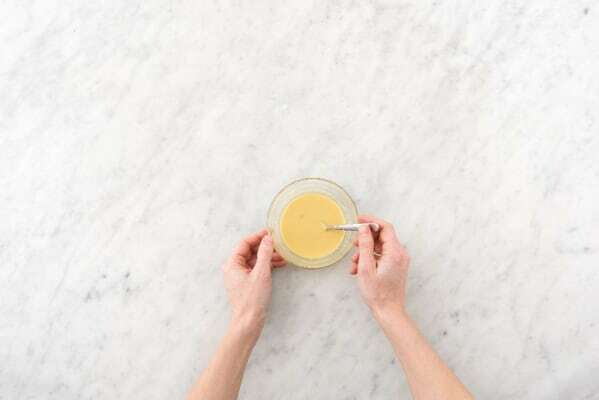 In a medium bowl, whisk together 1 tsp mustard (we sent more), juice from 1 lemon half, juice from 1 orange half, and a large drizzle of olive oil. Season with salt and pepper. 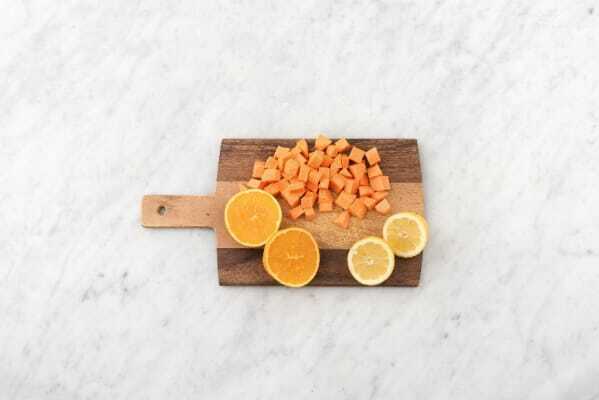 TIP: To add extra citrus to your salad, peel the remaining orange half and chop into pieces. Otherwise, save it for another use. 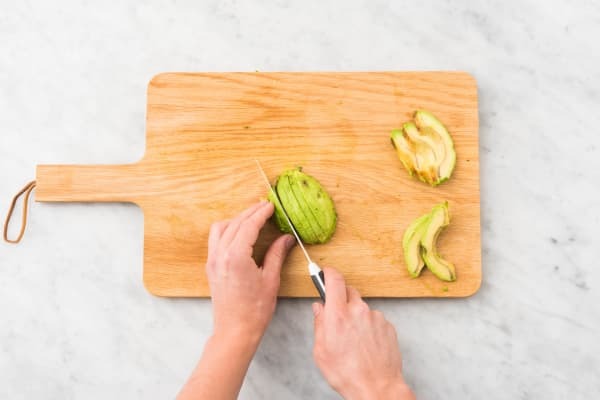 Halve, peel, and pit avocado, then thinly slice. Toss farro with half the dressing. Divide farro between plates. 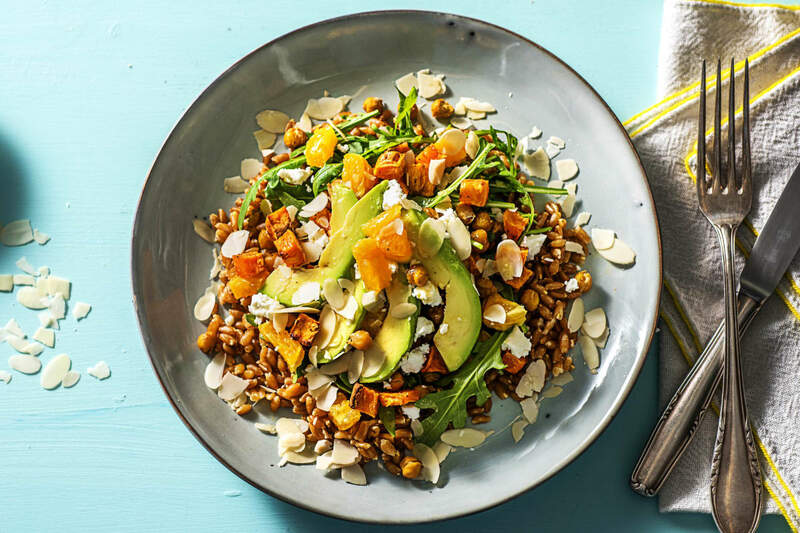 Toss arugula with as much of the remaining dressing as you like, then place on top of farro. Arrange sweet potatoes, chickpeas, avocado, and orange pieces (if using) on top, then sprinkle with almonds and feta cheese.